Tom Harvey Award Winner 2018 - Website of commday! The Governor of NSW, Hon David Hurley AC DSC (Ret'd) and the Hon Max Willis RFD Ed CSI, President of the Australia Youth Trust. Paul has been an ambassador for the Smith Family and the Learning For Life program for several years which has seen him travel across the state (from Maitland to Moruya) to speak to different audiences about the power of education to overcome disadvantage. Paul's passion for this cause is inspired by his own background having been raised by his grandparents in East Nowra and attending local public schools. Whilst studying at the University of Wollongong, Paul was actively involved in various clubs and societies and student advocacy, including serving as the Chair of the Student Representative Forum. Paul graduated from UOW in 2015 with a Bachelor of Laws and a Bachelor of Commerce and subsequently received a Graduate Diploma of Legal Practice from the Australian National University. In December 2015 Paul was admitted as a Solicitor in the Supreme Court of New South Wales and joined a local law firm becoming a member of the Real Estate and Estate Planning divisions based in Nowra. 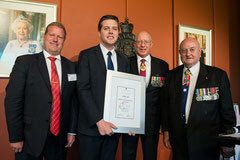 Another honour Paul recently achieved was to be elected to serve as the Graduate Representative on the University Council, the peak governing body of the University of Wollongong.